Mobile display technology is firmly split into two camps, the AMOLED and LCD crowds. Both are based on quite different underlying technologies, leading manufacturers to tout a number of different benefits depending on which display type they’ve opted for. Let’s find out if really there’s a noticeable difference between these two displays technologies, if there is what sort of differences we can expect, and if the company marketing hype is to be believed. We’ll start alphabetically with AMOLED, although to be a little broader we should probably start with a little background about OLED technology in general. It’s hidden in the name, but the key component in these display types is a Light Emitting Diode (LED). Electronics hobbyists will no doubt have played around with these little lights before, but in a display panel these are shrunk down dramatically and arranged in red, green and blue clusters to create an individual pixel that can reproduce white light and various colors. The arrangement of these subpixels can alter the performance of the displays slightly. NovaLED The structure of an organic light emitting diode. The O part in OLED stands for organic. Simply put, there are a series of thin organic material films placed between two conductors in each LED, which is then used to produce light when a current is applied. Finally, the AM part in AMOLED stands in for Active Matrix, rather than a passive matrix technology. This tells us how each little OLED is controlled. In a passive matrix, a complex grid system is used to control individual pixels, where integrated circuits control a charge sent down each column or row. But this is rather slow and can be imprecise. 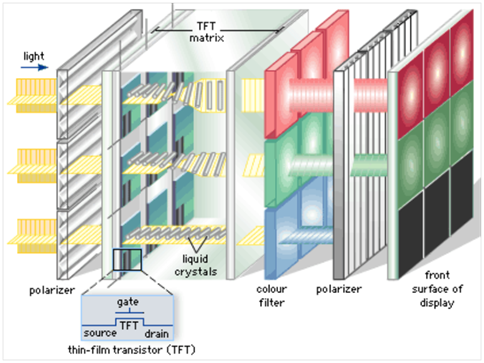 Active Matrix systems attach a thin film transistor (TFT) and capacitor to each LED. This way, when a row and column is activated to access a pixel, the capacitor at the correct pixel can retain its charge in between refresh cycles, allowing for faster and more precise control. ksgvo Active verses passive matrix OLED display designs. One other term you will encounter is Super AMOLED, which is Samsung’s marketing term for a display that incorporates the capacitive touchscreen right into the display, instead of it being a separate layer on top of the display. This makes the display thinner. The major benefits from OLED type displays comes from the high level of control that can be exerted over each pixel. Pixels can be switched completely off, allowing for deep blacks and a high contrast ratio. Being able to dim and turn off individual pixels also saves on power. The lack of other layers on top of the LEDs means that the maximum amount of light reaches the display surface, resulting in brighter images with better viewing angles. The use of LEDs also means that these displays can be very thin, making them ideal for mobile devices. Furthermore, the lack of a rigid backlight and innovations in flexible plastic substrates has already produced early generation flexible OLED based displays, which are very promising for wearables and creating new form factors for other gadgets. LCD stands for Liquid Crystal Display, and reproduces colors quite differently to AMOLED. Rather than using individual light emitting components, LCD displays rely on a backlight as the sole light source. Although multiple backlights can be used across a display to help save on power consumption, but this is more of a requirement in larger TVs. Scientifically speaking, there’s no individual white light wavelength. White light is a mixture of all other visible colors in the spectrum. Therefore, LCD backlights have to create a pseudo white light as efficiently as possible, which can then be filtered into different colors in the liquid crystal element. Most LCDs rely on a blue LED backlight which is filtered through a yellow phosphor coating, producing a pseudo white light. Power Electronics The spectral content of a single “white” LED is different from producing white light from three individual RGB LEDs. The really complicated part comes next, as light is then polarised and passed through a crystal element. The crystal can be twisted to varying degrees depending on the voltage applied to it, which adjusts the angle of the polarized light. The light then passes through a second polarized filter that is offset by 90 degrees compared with the first, which will attenuate the light based on its angle. Finally, a red, green, or blue color filter is applied to this light, and these sub-pixels are grouped into pixels to adjust colors across the display. All combined, this allows a LCD display to control the amount of RGB light reaching the surface by culling a backlight, rather than producing colored light in each pixel. Just like AMOLED, LCD displays can either be active or passive matrix devices, and you’ll often see active TFT LCD displays in mobile phones. This wide variation in the way that light is produced has quite a profound difference to the user experience. Color gamut is often the most talked about difference between the two display types, with AMOLED providing a greater range of color options than LCD, resulting in more vibrant looking images. OLED displays are known for additional green and blue saturations, as these tend to be the most powerful colors in the subpixel arrangement and very little green is required for white light. Some observers find that this extra saturation produces results that they find slightly unnatural looking. LCDs typically tend to overcompensate further into the reds, with more subdued greens. Although not possessing quite such a wide gamut, LCD displays typically offer a very close match to the Standard FBG color gamut profile used by image and video media. 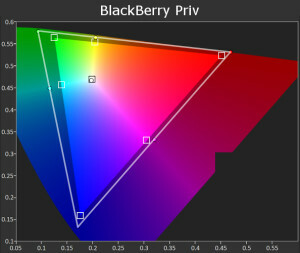 A closer examination of actual smartphone displays reveals that color gamut can vary quite considerably even between the same types of display. The graphs above show that even though the BlackBerry Priv and Galaxy Note 5 share an AMOLED display from the same manufacturer, they produce quite different gamut profiles, while the LCD backed V10 is different further still. The inclusion of multiple display profiles and different manufacturer calibration targets partly explains these differences, so few displays are ever exactly alike. Color accuracy is also another notable difference, particularly when it comes to whites. Our own testing of some of the best Android smartphones last year revealed that OLED based displays produced very accurate results, while LCD displays resulted in a slight blue tint. This isn’t so surprising though, given that LCD displays are based on a filtered blue backlight. The Z5 Premium and LG V10 (LCD) show a notable blue tint on whites compared with the Priv and Note 5 (AMOLED). As we mentioned before, the lack of a backlight and filtering layers also weighs quite heavily in favour of OLED over LCD. LCD displays often suffer from light bleed and a lower contrast ratio as the backlight doesn’t switch off even when pixels are supposed to be black, while OLED can simply switch off its pixels. LCD’s filtering layer also inherently blocks some light and the additional depth means that viewing angles are also reduced compared to OLED. One downside of AMOLED is that different LEDs have different life spans, meaning that the individual RBG light components eventually degrade at slightly different rates. As well as the dreaded but relatively rare burn-in phenomenon, OLED display color balance can drift very slightly over time, while LED’s single backlight means that color balance remains more consistent. There are some pros and cons to both technologies and some reasonable user preferences between the different color and contrast profiles. Although the prevalence of multiple display modes available in modern smartphones makes this somewhat less of an issue these days. However, the falling production costs and additional benefits of OLED displays makes them likely to be the technology to watch going forwards, with cheaper LCD units filling the gap in budget segments of the market. Major display manufacturers, such as LG Display, are betting big on OLED technology for the future, making major investments into additional production facilities. The AMOLED panel market is expected to be worth close to $30 billion in 2022, more than double its value today. Not to mention the as yet untapped market potential in flexible displays. That said, developments in Quantum Dot LCD displays could narrow the performance gap between LCD and OLED, so certainly don’t count LCD out of the race just yet.